Today, algorithms exert great power in the curation of everyday online content by prioritizing, classifying, associating, and filtering information. This power can shape the users’ experience and even the evolution of the system as a whole. For instance, believing that YouTube’s recommendation algorithm gave significant weight to a video response made to another video, a group of girls, known as “Reply Girls”, uploaded irrelevant video responses to already popular videos to move the video responses to the top of the suggested videos list. In an attempt to increase their view counts, “Reply Girls” also added sexually suggestive thumbnails to their posts and earned upwards of tens of thousands of dollars in ad sharing revenue. In another example, some Facebook users complained about or even tended to block new mothers in their News Feed, asserting that new mothers exclusively posted photos of their babies. However, it was found that Facebook News Feed curation algorithm created this misperception because it prioritizes posts that receive likes and comments – photos of babies often received attention from a large audience. While such powerful algorithms are omnipresent online, they are rarely highlighted in the interface, leaving users unaware of their presence. Even in cases where users are aware of these algorithms’ presence, the black boxes that house them usually prevent users from understanding the details of their functionality. While this opaqueness often exists to protect intellectual property, it also stems in part from the merits of “seamless” design, where designers hide details from users to make interactions “effortless”. However, some now argue that adding visibility into system boundaries through the revelation of “seams” helps people become more adaptive, innovative and intelligent users. For example, a site such as Kayak.com practices seamful design through its reliance on pop-up windows to establish credibility for competitive price quotes. However, such approaches have guided very few efforts in the domain of algorithms. RQ1-Algorithm Awareness: How knowledgeable are users about these algorithms, and how aware should they be of their existence and functionality? functionality, how will this insight affect their interaction experience? In this presentation, I present innovative approaches that we have explored and plan to explore in the future to answer the above questions. Motahhare Eslami is a 5th year Ph.D. candidate at Computer Science department, University of Illinois at Urbana-Champaign. Her research interests are in social computing, human computer interaction and data mining areas. She is interested in performing research to analyze and understand people’s behavior in online social networks. 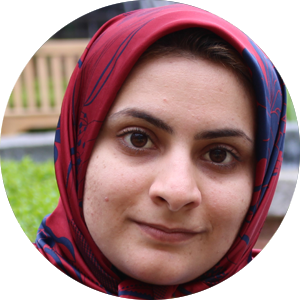 Her recent work has focused on the effects of feed personalization in social media and how the awareness of filtering algorithm’s existence affects users’ perception and behavior. Her work has published at prestigious conferences and also appeared internationally in the press- in the Washington Post, TIME, MIT Technology Review, New Scientist, the BBC, CBC Radio, Oglobo (a prominent Brazilian newspaper), numerous blogs, Fortune, and more. Her research has received honorable mention award at Facebook Midwest Regional Hackathon 2013 and the best paper award at CHI 2015. Motahhare has been nominated as a Google PhD Fellowship Nominee (2015 and 2016) and a Facebook PhD Fellowship Finalist (2016).